Extraordinary karate at the Africa Shoto Cup the past weekend with our honourable Japanese senseis; Chief Instructor of JKA/WK: Shuseki Shihan Masaaki Ueki Sensei (9th Dan) and JKA HQ Instructor International Affairs: Shihan Koichiro Okuma Sensei (6th Dan). Walking into the arena early Saturday morning was overwhelming yet intimidating out of a competitors’ point of view. Again Solis Ortus was well represented as Table officials, judges and referees on this prestigious event. Solis Ortus sat at the main table and did an excellent job. Thank you Sandy – as always a pleasure working with you…..and having fun on the side line of course, never a dull moment. African countries such as Mauritius, DRC, Angola, Kenya, Zimbabwe, Mozambique, Madagascar and Reunion came to participate against the cream of South Africa. South Africa was a formidable opponent and arose as the winner of the tournament. 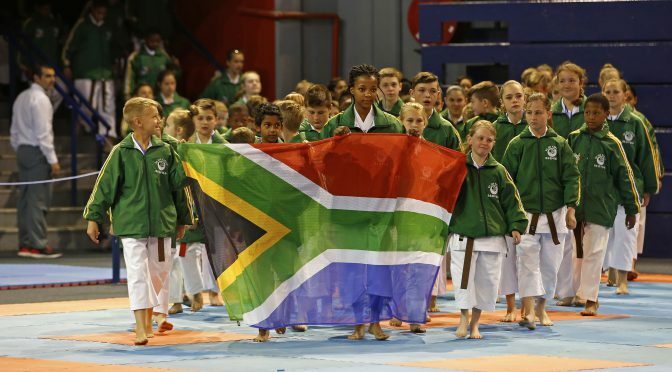 Solis Ortus had 8 athletes who competed for the day, Sandra Erasmus (Kata & Kumite), Cathy van Onselen (Kata & Kumite), Karin du Plessis (Kata & Kumite), Heilethe Calitz (Kata & Kumite), Lilian Mynhardt (Kumite), PW Pentz (Kumite), Fernando da Rosa (Kata & Kumite) and Suandri Esterhuizen (Kata). Most of them medalled for the day and brought home 9 medals; 4 gold and 5 bronze. Solis Ortus is extremely proud of each and everyone’s achievement for the day. Even if you have not medalled, just to be there was an honour and a great accomplishment. So, congratulations to all of you! You came to accomplish and you did. Sensei Eugene is tremendously proud of you all. One way – JKA, JKA – Solis Ortus.